Fig.1. My goal. To write scenes as fluidly as changing gear. Goal: What does my central character want from this scene? Conflict. Who is the conflict with? Disaster. What is the disaster for this scene? Fig.2. 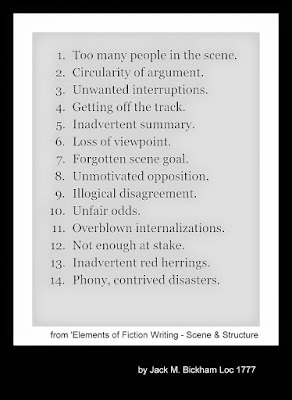 Common scene writing errors. From Bickman. I have characters, locations, events and situations in my head. For some characters the story runs for fifty years, most intense age 6 to 21. Armed with this editor’s tool I can ruthless delete, rewrite or come up with fresh scenes that meet the above criteria. It fits the pattern I want in my head of a story with momentum – that could be made into a linear drama for TV or film. 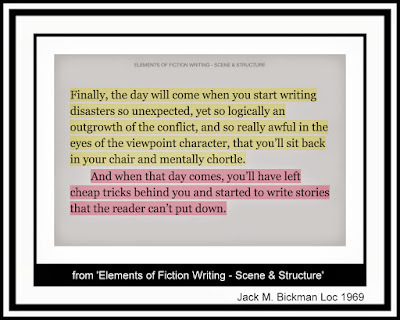 I particularly recognise the need to ask repeatedly ‘what is the disaster?’ to conclude a scene. I related to this from a career in writing persuasive copy and videos where you repeatedly ask, then ask again ‘what is the problem?” The first answer is usually weak, though compelling … more likely the ninth or tenth idea will fit the brief. 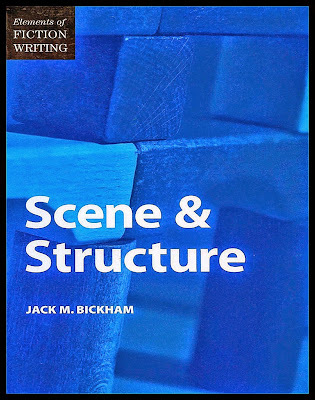 I continue to read, note and try ideas from Jack M. Bickham’s book ‘Elements of Fiction Writing – Scene & Structure.’ I continue with the Open University course on FutureLearn ‘Start Writing Fiction’, as well as content on Open Learn of the same title. By Jonathan Vernon in Writing on May 13, 2015 .